WEST MELBOURNE, Florida - West Melbourne police have arrested a man on Tuesday who is suspected of shooting at one of their officers Monday night. 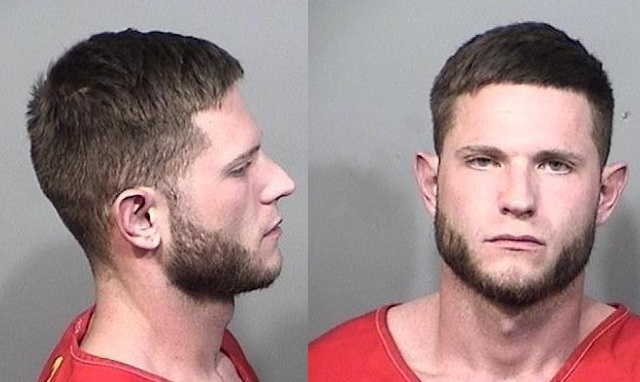 Police received information that Joseph Alan Bellinger was in a residence at 180 District Street SE in the City of Palm Bay. Detectives with the West Melbourne Police Department and Palm Bay Police Department’s Special Investigations Division maintained surveillance most of the day while probable cause was established. After conducting multiple interviews, executing search warrants, and examining physical evidence, detectives say that they developed probable cause for the arrest of Joseph Alan Bellinger. An arrest warrant was subsequently issued, charging Bellinger with attempted felony murder of a law enforcement officer, aggravated assault with a firearm, aggravated fleeing and attempting to elude a law enforcement officer, and discharging a firearm in public. West Melbourne Police then partnered with the Palm Bay Police Department’s SWAT Team to serve a search warrant at 180 District Street SE to affect Bellinger’s arrest. Bellinger was taken into custody without incident. Bellinger will be incarcerated at the Brevard County Jail with no bond. He will go before a judge tomorrow at 1:15 pm. Additional charges are pending. West Melbourne police say that there is no reason to believe Amanda Peacock was involved. She has cooperated with investigators.